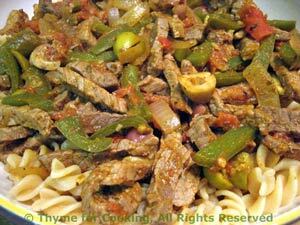 Pasta with Beef and Peppers, Thyme for Cooking easy skillet gourmet dinner. An Italian stir-fry! The beef and peppers will cook in less time than the pasta. This is not meant to have a 'sauce' in the traditional manner, but a light coating of flavors on the pasta with chunky beef and peppers on top. Peel and vertically slice (cut it in half first) the onion. Pit the olives if necessary and cut in half. Trim and slice the pepper into strips. Heat 2 tsp oil in large non-stick skillet. Add chili powder and sauté briefly. Add onions, garlic, peppers and sauté until tender, 7 - 8 minutes. Remove to a plate. Open and drain the tomatoes, discarding or saving juices for another use. Roughly chop the tomatoes. Add the tomatoes to the beef and sauté 5 minutes. Return peppers & onions to the pan and add olives and herbs. Cover and simmer 5 minutes, until everything is heated through. When pasta is done, drain and put into large pasta bowl. Add beef and peppers and toss to combine. Serve.